This weekend the second Africa Gathering in London – with the tagline “sharing ideas about positive change” – took place and I was there, representing ICT4D.at, taking notes of the presentations and shooting some blurry photos. The event was – again – really great with presentations from different sectors and speakers with extremely diverse backgrounds. It was split in two parts with Friday as networking event with fewer attendees and Saturday with a bigger audience – although the format of the presentations of the two days didn’t differ very much. My personal highlights of Friday were Leon Benjamin’s presentation advertising different – collaborative and self-organized – ways of organizing work, and Bill Liao’s musings on humanity – leading to such diverse things as “thrivability” and the planting of trees to save the planet. The underlying theme of both presentations was that “it” can’t go on that way – may “it” be the current “command and control” structure of society and organizations, or the destruction of the planet. The presenters showed ways how to improve the situation – and both incorporated more collaboration and leaving the current hierarchical system structure. On Saturday, amongst other presentations there were two moving personal stories of people who now engage themselves fully in helping disadvantaged children. Kevin “Banana Man” Alan, a former martial arts trainer from Liverpool who was moved by a TV documentary in a way that he almost suddenly changed his life to dedicate all he had to helping children in Zulu Land, South Africa. His charity Banana Appeal plants fruit trees to feed the poor children and supports them to be able to go to school. The second personal story was rapper Emmanuel Jal, a former child soldier in Sudan who was smuggled out of the country by an aid worker and deals with his past by writing lyrics and making music. He also formed a charity – GUA Africa – which works with families affected by war – helping the children to receive education. Two other very interesting presentations from Saturday were one about CreditSMS – now FrontlinsSMS Credit – trying to provide banking services to as many people as possible via sms (basing on FrontlineSMS), and one about Africa Rural Connect, a platform where ideas how to improve Africa’s agriculture are shared, rated and experience is exchanged. I would like to mention another Africa Gathering participant here which didn’t have a presentation but showcased a prototype – Simon Berry of Colalife. He is campaigning to persuade Coca Cola to open its distibution channel in developing countries, allowing the delivery of “social goods” such as medication through this channel. I really like the idea and think it’s absolutely worth supporting. 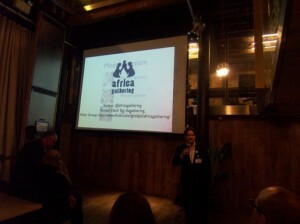 He presented at the first Africa Gathering earlier this year. All in all I am happy to have attended Africa Gathering once more, there were a lot of interesting people around with a strong desire to change the current way of things. 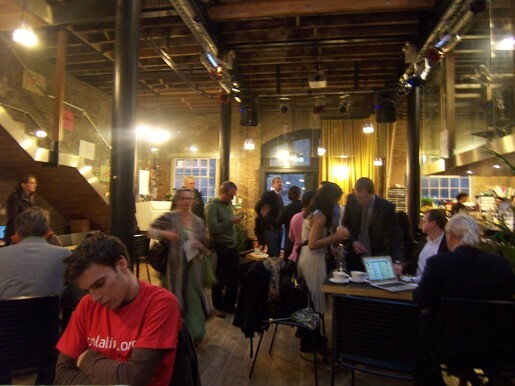 The location – The Hub close to King’s Cross – was very nice and there was enough time to socialize and get to know each other. The mix of presentations was interesting and inspiring, thanks Ed Scotcher and team for organizing the whole event.